The brother of a man condemned to death as a teenager spoke Thursday of his relief after the president granted a stay of execution. Shafqat Hussain, convicted of killing a seven-year-old boy in Karachi in 2004, was just hours away from the gallows when the delay order was given late on Wednesday. The case has attracted international attention as Hussain was apparently only 15 years old at the time of the killing and rights campaigners say he did not have a fair trial. The United Nations highlighted the case on Thursday as it urged Pakistan to reinstate a moratorium on the death penalty which was lifted after six years in December after a Taliban massacre at a school. Hussain’s brother Gul Zaman described going to bid him farewell in jail in Karachi late on Wednesday, only to be told of the temporary reprieve. “Shafqat was looking worried. I could see the despair on his face, his tears were rolling as he spoke to me in a very low voice,” Zaman said by phone from Karachi. Late on Wednesday the presidency ordered a 30-day stay of execution, but Interior Minister Chaudhry Nisar Ali Khan told parliament on Thursday the delay was only for 72 hours. Sumaira Bibi, Hussain’s elder sister, said the family were overcome with gratitude when news of the stay came through. 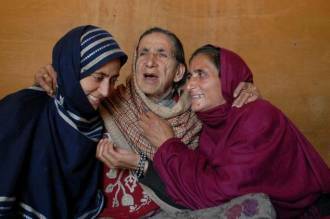 “We are thankful to all those people who help in the postponement of the hanging of our brother,” she told AFP in Kashmir, where the family live. Pakistan has hanged 48 convicts since restarting executions in December after Taliban militants murdered more than 150 people at a school, most of them children, angering rights activists and alarming some foreign countries. Hussain had been due to face the noose on January 14, but the government halted the execution in the face of protests and ordered an investigation. But an anti-terrorism court in Karachi last week ordered the hanging to go ahead — until Wednesday’s 11th-hour intervention. Zaman said he left his brother after midnight, with only around five hours left until the hanging was due. “He hugged me very gently and held me for a very brief moment. He then left me, turned around, his head was bowed as one of the prison officials brought the execution dress,” Zaman said. Hussain’s mother said she felt that “God has given me back my son”. “I am praying for everybody, especially the president, the judiciary and the media who help in the postponement of the hanging of my son,” she said. Speaking in the National Assembly on Thursday, interior minister Khan said there was conflicting evidence about Hussain’s true age. A birth certificate has appeared in media reports, but there is no proof that it is correct, Khan said. Exact birth records are not always kept in Pakistan, particularly for people from poor families like Hussain’s.